Western blot analysis of extracts from serum-starved (6 hours) S2 cells treated with 10 ug/ml insulin with or without 1 uM wortmannin pretreatment, using Phospho-Drosophila Akt (Ser505) Antibody (top) or Akt antibody #9272 (bottom). 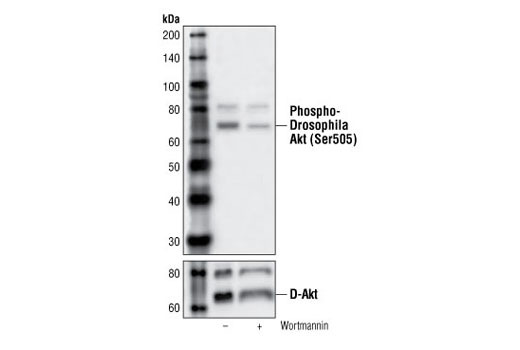 Phospho Drosophila Akt (Ser505) Antibody detects endogenous levels of Akt only when phosphorylated at serine 505. It does not recognize drosophila Akt when phosphorylated at other sites, nor does it recognize related kinases such as PKC or p70 S6 Kinase. Polyclonal antibodies are produced by immunizing animals with a synthetic phosphopeptide corresponding to residues around Ser505 of drosophila Akt. Antibodies are purified by protein A and peptide affinity chromatography. Drosophila Akt (D-Akt) regulates multiple biological processes such as cell survival (20) and cell growth (21). Major sites of phosphorylation include Ser505 and Thr342. These activation sites are homologous to mammalian Ser473 and Thr308 respectively. Identified downstream targets of D-Akt include Trh (Ser665) (22) and Tsc2 (23). Like Akt, D-Akt functions in a wortmannin-sensitive pathway involving PI3 kinase (24). Staveley, B. E. et al. (1998) Curr Biol 8(10) , 599-602. Scanga, S. E. et al. (2000) Oncogene 19, 3971-3977. Jin, J. et al. (2001) Dev Cell 1(6) , 726-728. Potter, C. J. et al. (2002) Nature Cell Biology 4, 658-665. Linassier, C. et al. (1997) Biochem. J. 321, 849-856.